Modern bottle generators are quiet, reliable, efficient, and cause relatively low drag. They can slip in the rain, but I’ve never had any issues with mine when it’s wet. My tires have a grooved band for the generator wheel to grab, so everything stays pretty much where it should be. This morning, however, I discovered where these generators come up short: snow. You can see to the left how little was on the roads, but it was enough to kick up under my fender and rain back down on the generator wheel, stopping up the works. My light up front would flicker, then go out as long as I was in the snow. Fortunately, everywhere cars had been was clear and after a few seconds on that pavement, the snow would shake off and the generator would catch again. 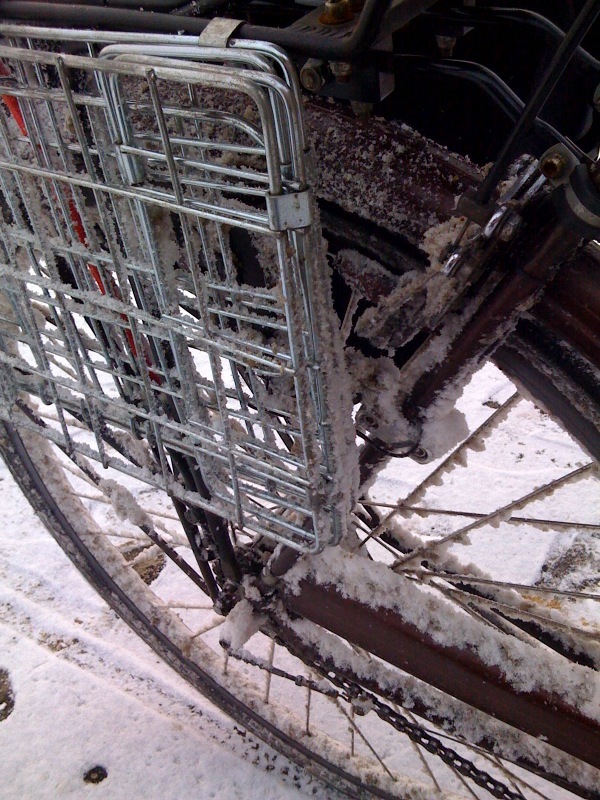 Riding in this kind of fresh snow on my bike is fine, but I can’t fit studded tires on my wheels so any deeper and I can’t ride. All this is an argument for a dynohub, like any in the Shimano line. A dynohub is a replacement for the hub in your front wheel. Like a bottle, it generates electricity as it spins but it exposes none of its mechanical parts to the elements and so works in any conditions and needs no adjustments. They’re twice as expensive and they also come with the cost of having a new wheel built, but they will power your lights for many hundreds of hours without you ever having to think about them.